In 1995, the financial markets were shaken by a massive scandal. Barings, one of the most prestigious banks in the United Kingdom is bankrupt following losses caused by Nick Leeson, one of its traders, aged 28 years. London beginning of the year 1990. The prestigious Barings Bank sends one of their traders, a young Englishman named Nick Leeson born in February 1997, to work in its Singapore branch. Barings is one of the most reputable financial institutions in all of the United Kingdom. Founded in 1762 by the Dutch Johann Baring, who had immigrated to England, Barings formed part of the country?s history. Even the Queen of England was among its clients. Coming from a relatively modest background (his father is a plasterer), Nick Leeson did not follow higher education, but this is not a requirement needed to find a job in a bank. His adolescence was spent at Watford where he attended high school, whereafter he began to work at Coutts & Company and then spent two years at Morgan Stanley. Here he took up a position as an operations assistant, allowing him to become familiar with the financial markets which was gaining more significance towards the end of the 1980?s. Leeson then joined Barings, here he quickly made a good impression within the respectable establishment. He was promoted on the trading floor and in 1990, was appointed manager in Singapore where he had to operate on the “futures” of SIMEX (Singapore International Monetary Exchange). A relentless worker, Nick Leeson quickly became a renowned operator of the derivative products market on the SIMEX, and is considered as one of those who “moves” the market. From 1992, Leeson made unauthorized speculative trades that at first made huge contributions for Barings - up to 10% of the bank?s profits at the end of 1993. He became a star within the organisation, earning unlimited trust from his London bosses who considered him nearly infallible. Barely aged 25, Leeson had a professional situation that he had never dreamed of, even though he had entered into a professional life about ten years too early. However, he soon lost money in his operations and hid the losses in an error account, 88888. He claimed that the account had been opened in order to correct an error made by an inexperienced member of the team. At the same time, Leeson hid documents from statutory auditors of the bank, making the internal control of Barings seem completely inefficient. At the end of 1994, his total losses amounted to more than 208 million pounds, almost half of the capital of Barings. On January 16th, 1995, with the aim of "recovering" his losses, Leeson placed a short straddle on Singapore Stock Exchange and on Nikkei Stock Exchange, betting that Nikkei would drop below 19 000 points. But the next day, the unexpected earthquake of Kobé shattered his strategy. Nikkei lost 7 % in the week while the Japanese economy seemed on the verge of recovery after 30 weeks of recession. Nick Leeson took a 7 billion dollar value futures position in Japanese equities and interest rates, linked to the variation of Nikkei. He was "long" on Nikkei. In the three days following the earthquake of Kobé, Leeson bought more than 20 000 futures, each worth 180 000 dollars. He tried to recoup his losses by taking even more risky positions, betting that the Nikkei Stock Exchange would make a rapid recovery; he believed he could move the market but he lost his bet, worsening his losses. They attained an abysmal low, (1,4 billion dollars), more than double the bank?s capital who is now bankrupt because its own capital would be insufficient to absorb the losses generated by Leeson. In Singapore, Leeson enjoyed a freedom within the local office - even an internal memo from 1993 proved to have no consequence; this would shown the lack of surveillance in this office as well as the risk of possible disaster. What?s more, Leeson operated in both the dealing desk (front office) and the back office. So he confirmed and settled trades transacted by the front office - which he himself passed! He was therefore able to hide what he wanted. The profits brought in by Leeson instilled confidence in management who lacked knowledge in subtile trading techniques and financial markets, and therefore did not pose any questions at Leeson. They did not seem to be aware of the risks incurred by the bank. Leeson made false declarations to regulation authorities which allowed him to accumulate his losses and to avoid a margin call which should have audited losses from day to day. It is true that these false declarations did not attract the attention of control authorities in Singapore. Finally, nothing was detected by statutory auditors and control interns, despite the fact that Leeson had hidden certain losses and had forged documents - both of which should have drawn attention to him. This proves that the account regulation procedures within the institution were completely inefficient. Feeling that his losses had become to great and seeing that the bank was on the verge of a crisis, Leeson decided to flee, leaving a note which read “I?m sorry”. He went to Malaysia, Thailand and finally Germany. 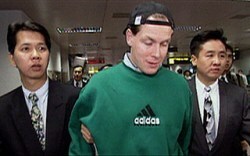 Here he was arrested upon landing and extradited back to Singapore on 2 March 1995. He was condemned to six and a half years in prison but was released in 1999 after a diagnosis of colon cancer. In 1996 he published an autobiography “Rogue Trader” in which he detailed his acts leading to the collapse of Barings. The book was later made into a film starring Ewan McGregor as Leeson. The fall of Barings caused an unprecedented crisis within the city. Nine senior managers were accused of having badly managed the situation and in March 1995 the bank (only the parent company) was bought by Dutch group ING. It was the less than glorious disappearance of a bank founded in the 18th century after 223 years of existence. The bankruptcy of Barings had a world-wide impact, affecting even those who were not among the financial circles. The public expressed concern about the use of by-products and about the "madness of financial markets" where young "golden boys" of less than 30 years can cause the demise of financial institutions which nevertheless had experienced a dozen crises during two hundred years. At the end of the day, there are always risks in the financial markets that even teams with the best specialists who hold Nobel prizes are not able to avoid. This affair has nevertheless lead to the creation of new jobs such as "compliance officers," has strengthened the role of risk control within investment banks and has created a separation between Front, Middle and Back Office functions.